Next, under 'Create Default Pages' you may create a set of pages to quickly get started filling in your site content. This tool creates: Home, Galleries, Blog, About and Contact. It will also set your 'Home' as your frontpage. 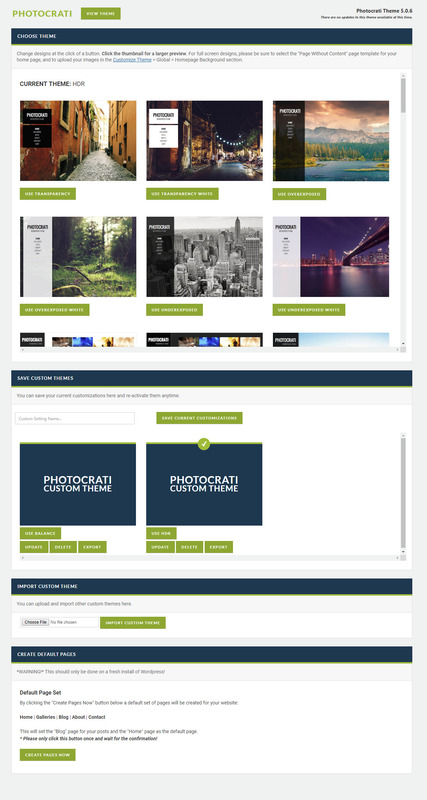 The default setup without running this Create Pages tool, is your blog posts will appear as your frontpage. Running this tool sets the blog posts to appear on the 'Blog' page. *Do not run this tool more than once, only click one time. If you have already created some of these pages on your own, and you'd like to run this tool, I would suggest deleting those pages first, go to Pages >> trash and permanently delete the pages. Then come back here and run the tool.